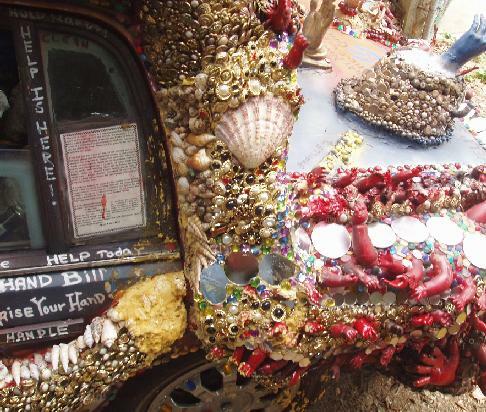 Handy Car, A.K.A., The Epicentral Shrine to the Helping Hand Vehicular, 1990 Pontiac Grand Am, Artcar died peacefully in its sleep on 8/30/ 2014 of massive terminal electronic failure. 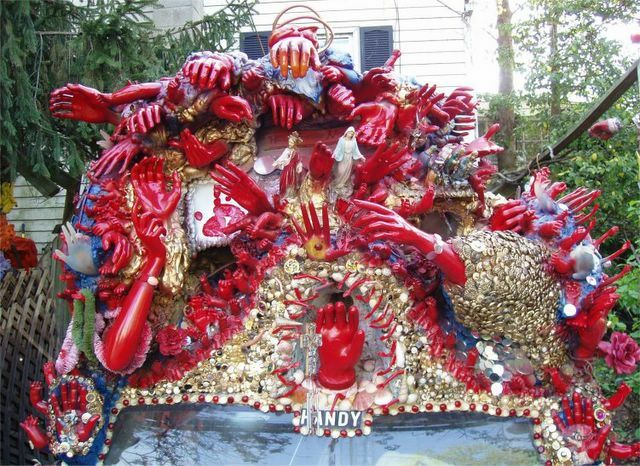 Handy Car was a world class, iconic, Baltimore Artcar which after its birth as an artwork, commissioned for First Night Annapolis in 1999-2000 went on to win the world’s top Daily Driver Artcar award at Houston’s Orange Show Artcar Weekend in 2005. 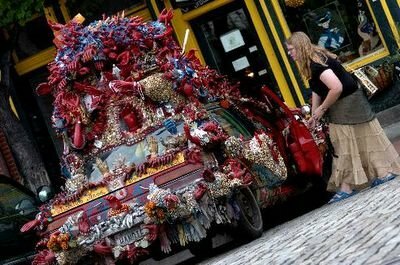 The car was an Iconic “Baltimore Artcar” created by cartist Conrad Bladey, which delighted countless thousands as it traveled the streets of Baltimore and the region daily. It was a fixture at the Artscape Car Show and appeared in many other parades and events ranging from Houston Texas to Louisville Kentucky, Providence Rhode Island and Newark Delaware. Handy was even on the cover of a CD “Handy” by Big Blow and the Bushwackers. Handy was preceded in death by other famous Bladey artcars: Stickercar 1, Stickercar 2, Mondrian Mobile, Soul Car Magnet Truck and Party Car. Handy is survived by Handy Truck (to which handy donated many of its arms and hands) and its loving family: creator Conrad, his wife Mary and their daughter Margaret. Free RSVP essential to cbladey@verizon.net or 443-370-4011 by 9/12. In lieu of flowers doll hands, and Mannequin hands will be accepted. Cash donations are discouraged. 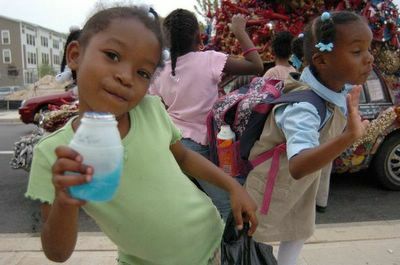 Food and drink donations are welcome. Interment will be at Crazy Rays junk yard in the following week. Not much new to report about Handy Car. But we hope there will be progress next week as I get it started and in for fuel pump work. Once that is over there is a front left brake issue of some form then we have to save to work on the front struts aboiut 800 dollars....To open the hood latch I ripped out the grill. That will require more hands and art so maybe rolling next week struts in a month or so with art added along the way. Summary: Local Artcar artist (Cartist) Conrad Bladey becomes the first Cartist to replace fossil fuel powered lights with Green solar powered lights to create a dazzling artcar experience. 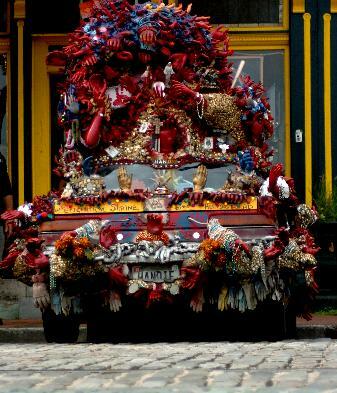 The cars with the new lights will appear at Artscape 2008 and delight thousands. Description: Equipping Artcars to appear at nighttime events has always been a challenge. Cars have been covered in lights presenting light shows. Others have utilized Christmas lights. Conrad Bladey started using Christmas lights and then moved on to rope lights. Lights meant that cars had to be equipped with batteries and power inverters which transformed the DC current of the car battery and alternator, powered by gasoline into AC current required by the lights. Once one installed the technology one still had to burn fossil fuel in the car engine and cause pollution to charge the battery. Batteries also, filled with acid would also wear out creating yet another pollution problem. At first there looked to be no alternative. Years ago when solar lights came on the market they were expensive and were limited to a warm glow that one could hardly see. This year Conrad Bladey looked at the solution once again. He considered garden new landscaping lighting in the form of spotlights. These turned out to be ideal. The process was slow in the beginning with the addition of one light here and there. Money was tight so slowly funds were scraped together to buy a few more lights over time until each of the five Bladey artcars were equipped. The latest edition turned out to be quite powerful. Handy Car (a world famous Bladey artcar which has taken top honors in the artcar world) received a set of three solar powered spotlights and a glass hand for its mirror covered grotto above the trunk in the rear. 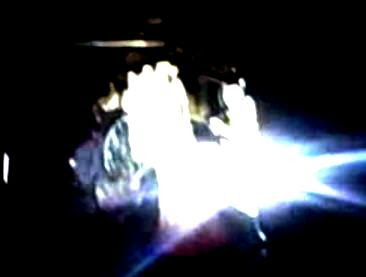 No one knew what the effect would be until the power of the sun was switched on that night. The effect was truly amazing. The three lights were amplified by the large glass hand and reflected by the mirrors creating a light show experience second to none. It could be seen for blocks. 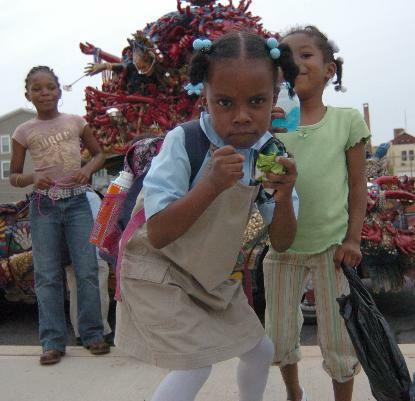 This year all of the cars with the new Green Solar lights will be on display at Artscape 2008. One car will even have temporary solar lights mounted on magnets so they can be moved around and stored when not in use. The application has importance well beyond art. Conrad has noted a sharp decline in vandalism to his cars which are parked on the street after the lights were installed. 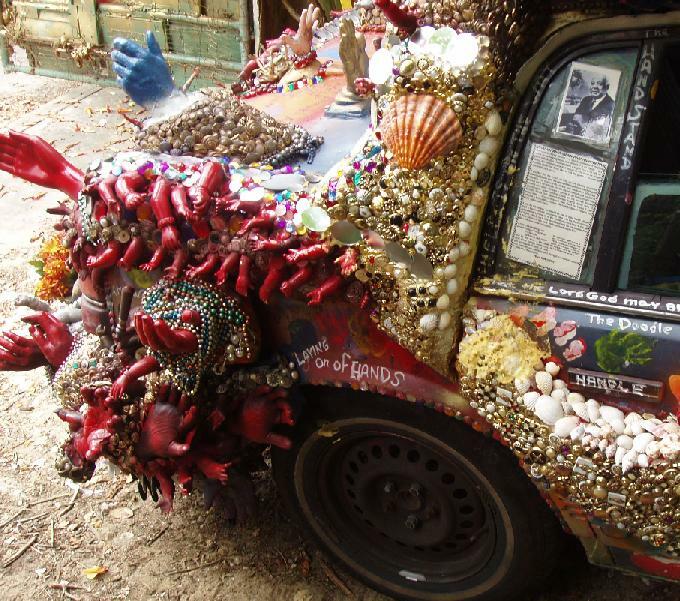 Perhaps the Artcars may lead others to discover not only a Green alternative but a security technology as well. Absolutely Briliant! and All from the Sun! So bright it can barely be photographed visible for blocks. Yes indeed folks! It lights up with three solar powered landscaping lights -amazing! new work on handy car!